I’m sitting in the tent at 8300 meters, bent over my sleeping bag. Every time I lean back for a rest, angry cough immediately makes me sit up again. I drink as much water or tea as I can, and check my watch often – I am waiting for 10:30pm, when I plan to start getting ready to leave – for the summit of Everest. Meanwhile, I talk to my summit day climbing Sherpa, Pasang Wongchu, with whom I was previously climbing on Manaslu, Ama Dablam, Ganchenpo and Cholatse, about our ‘strategy’: times, oxygen etc… It is never mentioned in the conversation that, sick as I am already, I could get worse while we’re climbing, and helping me down would be desperately hard work. The very narrow traverses over vertiginous drop-offs of 3000 meters and steep rocky pitches, such as the notorious Second Step, make rescues in the death zone impossible: one has to reach the summit and return on their own two feet, or stay on the mountain; no one could ‘carry’ you to the summit or back down – it is ignorant and cruel of people, who have no mountaineering experience, to suggest otherwise. Pasang and I are both well aware of the risks that pushing for the summit entails for each of us, but, having climbed together before, we know that we can trust each other’s judgement: I would turn back if I felt I absolutely had to; I would turn back if he said I should. Yet, as the sun sets, and the icy evening descends upon the highest campsite in the world, turning back is not what’s on my mind. I choose to think only the most trivial thoughts, and sit, wait and hope that, when I start walking, I feel stronger and warmer than I’m feeling now. It takes a small eternity to put my boots, harness and crampons on, but at 11:15 pm I am outside the tent, ready to leave at our team’s departure time 15 minutes later. The weather is cold, naturally, but not the coldest I’ve had to climb in, and the wind is not too strong. Headlamp beams of the climbers who have left Camp 3 before us dance along the route to the top of the world. I can’t see any features of the route – just this dance of scattered lights, some close to me, and some – too far away. At 11:30 pm on the dot we take our first steps towards the summit. They are so unbearably hard on my drained body that I have to shut my mind down completely – all it can do now is tell me to please, please stop this torture and turn back, and I don’t want to hear that. The pace I’m walking at is, perhaps, a bit too fast (not in sea-level terms, of course) as I have to sit down and rest at almost every other rope anchor. Yet, I have to push myself, or the ‘reasonable Mila’ I’ve been trying to silence will start talking again: ‘I can’t do this, I can’t do this…’ – she is such a whinge! Soon we reach the famous Exit Cracks – the steep rocky pitch which leads climbers onto the North Ridge. I have been warm until then but, stuck in line behind slow, inexperienced climbers I begin to freeze: I am loosing feeling in my hands in spite of wearing two layers of gloves plus down mitts, and my toes are painfully cold; I massage my palms and move my toes non-stop. I cough and shiver for some 30-40 minutes, until it’s my turn to go. Pasang and I climb onto the Ridge, and continue up. On our way we pass a few climbers; most memorably, a young Chinese woman with her guide. She is slow and insecure on her legs, and he shouts at her angrily. I am sorry for her, and I wonder how she can carry on like that. ‘The Second Step should be close now; perhaps, another hour,’ I tell myself. The Second Step is a long, difficult climb up vertical rock, rock with as much history as the mountain itself. Its technical difficulty is such that two ladders have been anchored to it: one small one at the foot of the Step and one tall one, which leads to the top. It is between them, where climbers tend to struggle as they get past a couple of large, protruding rocks, which requires some skill and, perhaps, a bit of courage. The problem is that the Second Step is very exposed – there’s a 3000-meter drop off all the way to the Rongbuk Glacier under your feet, and all that’s standing between you and a ‘speed descent’ is 8.5mm rope, an aging ladder and your strength. It’s an intimidating thought, so I chase it out of my mind, and start for the Step. It will be another 20-30 minutes before I reach the first ladder – the climbers ahead of me are moving up the Step very slowly. It is the coldest hour of the morning, right before sunrise, when the first pale, bloodless-pink strip of light cuts through the still-dark sky. I wish I had my camera, but I’d given it to Pasang to keep warm, so I simply stare at the white peaks, all far below, at the sky, shedding its night skin, and at the light, which will soon bring a little bit of warmth to the death zone’s unwelcome visitors… Climbing the first wobbly ladder is no problem. However, the rocks, hovering over the white abyss, require me to abandon all half-hearted attempts at graceful climbing: pulling hard on the rope, I straddle one of them, cough a piece of something up, get on my knees, and go for the second ladder – but not before I’ve looked around me. 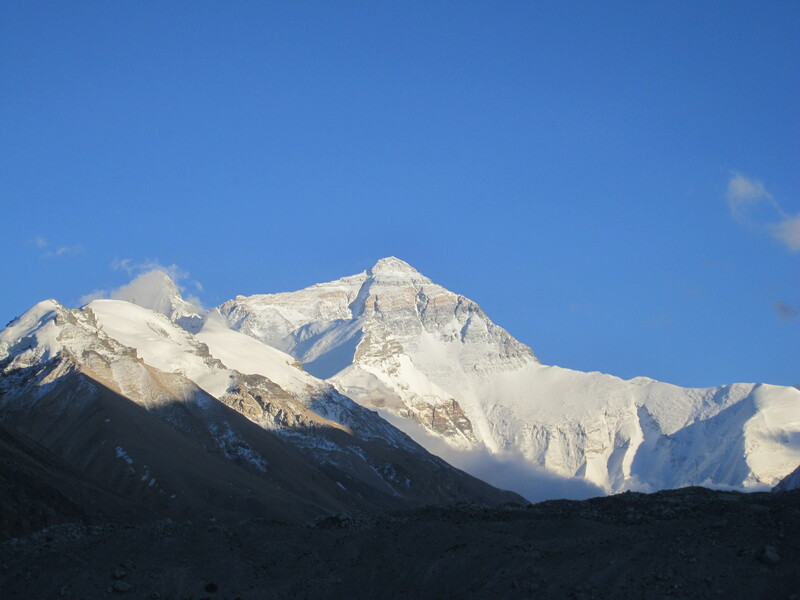 I’ve never seen anything more special: already higher than any mountain on Earth, I am standing at the edge of the sky, a part of this mellow dawn and of the great, harsh Chomolungma… ‘Will it be worth it?’, I remember asking myself on the way to Camp 3. ‘Of course, it’s worth it.’ The second ladder is no trouble to climb. Under the Third Step another body, dressed in a yellow down suit, lies in fetal position, very close to the rope leading up the Step. Having waited, as usual, I take my turn climbing up. When I’m almost at the top, I see a climber come to the edge of the Step, with his Sherpa behind him, and sit right on the rope. I try to get around him but the rope won’t let me do so without unclipping: there’s already one corpse at the foot of the Step, so I won’t do it. As the climber watches me struggle, he also directs my efforts to get past him – he simply won’t move. ‘Move back, please!’ I growl at him in my sick, gurgling voice, angered by his insolence. Immediately I have to giggle when the human obstacle almost jumps back and, effectively, out of the way. Never knew I could be quite so scary! ‘Now, up the snow ramp, and there it is, the summit,’ I tell myself at the top of the Third Step. Silly me! The way does lie up the ramp but that’s not the end of the way. After the snow ramp there’s still a very exposed, narrow traverse to negotiate, then, another small rocky ramp to climb, and then, the summit is just up the slope – and it feels like such a long slope to me. As we make our final steps towards the summit, we meet Pasang Nima, Grant and Phil, on their way down. We shake hands and chat briefly before going our separate ways. Several more steps, and I stand in the strong summit wind, which dances dementedly around me; I can see the whole of the sky. Here it is – the world’s most famous ‘mountain’ of prayer-flags and khatas, which marks the summit of Everest. I have seen it so many times before – in movies, in pictures – and now I can touch it, touch the very spot where Light first touches the Earth. It’s 8 am, and there are about 8-10 people on the summit, taking pictures, laughing. Pasang takes my camera out of his pocket and snaps a photo of me next to the prayer-flags. Then, I take my backpack off, and reach for a small bag of white cotton, where I’ve been keeping things to take to the summit: a khata from Pema Choling Monastery’s kids, a thread bracelet from a friend, who dreams of climbing Everest, and something from my mother – these three things I leave for Chomolungma to bless, and pray that She take care of the people whom they belong to. Then, Pasang and I take another summit photo with my camera (the battery in his is frozen), and agree to head down. We change our O2 bottles, look around one more time, and leave. Although we’ve only spent about 20 minutes on the summit, it’s enough. Now, on the way down, I feel strangely calm – in spite of the cough, and the wind, and the utter absence of strength in my limbs, and the fact that I am hours away from the relative safety of camp… In fact, I feel so calm, I am almost falling asleep as I’m walking along the terribly narrow traverse on the side of the summit pyramid. I think, I’m as calm as someone dying in peace. Thanks for reading the long post :)! Glad you liked it! VICTORY ! CONGRATULATIONS. WHEN YOU ARE RESTED AND SETTLED YOU MUST DO A GUEST POST ON MY BLOG. I would love to do a guest post on your blog! There’s just two problems here: I can’t draw cartoons and I have no sense of humor ;)! Wow, congrats! 🙂 great post and thanks for sharing! Thank you for your comment, Lisa! I’m happy you enjoyed reading the post! As I have said before you are an excellent writer and an amazing person! It’s truly flattering to me that you keep visiting my blog and reading my lengthy posts! Means a lot, thank you ;)! I loved reading your account of your summit push! You really are a great writer. I just stumbled upon your blog and will have to read it from the beginning. One question before I start, was the first corpse you came across a fatality that happened this season? Someone you met earlier? Also, was the second corpse “Green Boots” or someone else? I can’t imagine being so close to dead bodies while trying to push your own body to the limit. Has to be such a difficult thing to do. Again, thanks for your info, fascinating! Hi, Jim! Thank you for reading the blog, and for your kind feedback. Let me try to answer your questions. The first body I describe is not a fatality from this season. I never met the climber but had a dream on my first night at base camp that somebody was sitting next to me in the tent, looking exactly like that climber. It was a little strange to recognize him on summit day. The second body mentioned in the blog is not ‘Green Boots’. Unfortunately, I don’t know who that climber was or when he died. As for ‘Green Boots’, I heard he was an Indian climber who died on the mountain in the late ’90. I saw his body in a cave on my way down from the summit. I may be wrong, but I believe that sometime between 2007-2009 the North Side’s bodies were ‘removed’ from the mountain. 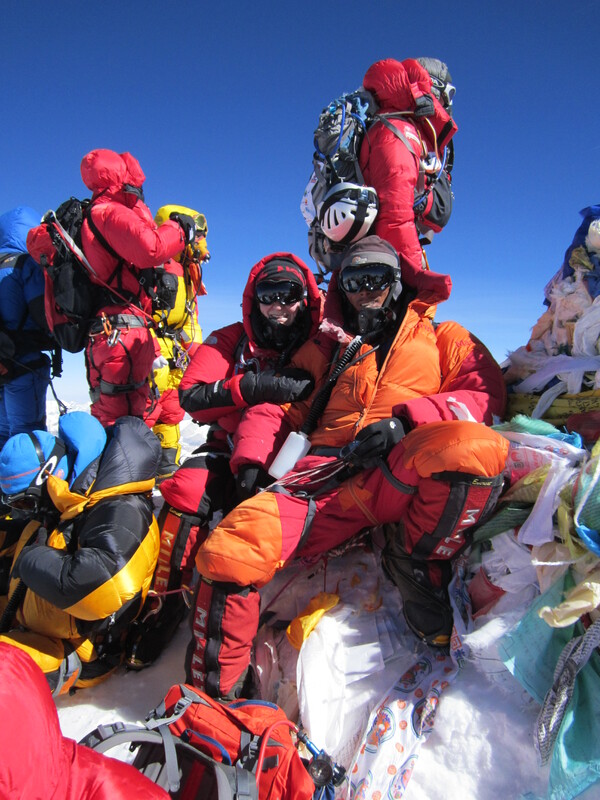 Thus, all the corpses that climbers see on their summit day now are those of Everest’s fairly recent victims. Sadly, there are quite a few, and it is very hard and painful to see them there. I was thinking the second body you mentioned was Green Boots since he is in the fetal position as well. You are correct about who he is, in fact Green Boots is Tsewang Paljor who passed away during the horrific 1996 season that has become so famous. I guess it is the Psychology Degree in me that makes this all so fascinating. The fact that people make a pilgrimage to Everest every year only to die there really blows my mind. I was told that David Sharp’s body was removed in 2007 or so but I am not sure if that is the case. If the cannot remove Pailor’s body I am not sure how they would be able to remove Sharp’s. Again, I am not a mountaineer and don’t know what is correct or not but I can’t seem to get enough information to satisfy my curious nature about all this. I simply find it incredible. ‘Green Boots’ could not be removed because he is frozen to the mountain in a small cave. David Sharp’s body and many others, however, were removed successfully. Thanks for your feedback again, and all the best! This is the most amazing narration. Your courage is astronomical! Thank you so much, Carl! However, I don’t believe it was courage that was driving me forward but anger – at myself, for my many failures. But also just love – for the mountain. Once again, fantastic insight for me, not only for Mt Everest, but climbing in general. I go back to your words of friends and family in your previos account, and of the courage that those people also have. My wife does not dwell on the possible outcomes, and supports me all the way, totally committed. That takes a lot of courage! Exactly! Our – climbers’ – courage is nothing compared to the courage it takes to trust us to return.